I built an insulated chicken coop on the 2nd floor of my c. 1890 urban horse barn -- you know, the kind of barn designed for your urban-transportation horse -- one stall, small tack area, buggy parking, and a hay loft. The barn is about 14 x 30. In Central Vermont, it typically gets to -25°F a couple nights a year here, with daytime temps not above 0°F for a couple days. More normally, our winter lows will be between -15 and +15. We have just over 8200 heating degree days in a typical year. This is USDA garden zone 4. Because this is my winter coop -- in the summer I have a chicken tractor -- heat management was completely integral to the whole design, and is highlighted throughout the information below. Why I Built on the Second Floor: 4850 square feet is the size of my lot - smaller than some people's houses! The house, barn, and driveway take up about 2/3 of that space. There's no space for a chicken coop anywhere in the yard. Snow slides off my metal roof into my front and backyards, and I need somewhere to put the snow from shoveling my driveway. My entire yard space is covered with snow 3-5' deep for most of the winter. The first floor of my barn is full of tools and bicycles, and is used as a garage for one car. As a result, I decided to build the coop into the second floor of the barn. My coop is built into the corner of the hayloft, on the second floor. It has two single-pane windows in the south corner that face south-east and south-west. I left one pane out of the window, so the chickens have a 7"x9" door. Even with heavy breed chickens, this door is large enough for them to squeeze through. Size of Coop & Number of Chickens: The coop is about 4' wide x 5' long x 5.5' high at its highest point. I have 4 heavy-breed chickens. I found a website that suggests that each chicken puts out 8 BTUs per hour per pound. If my chickens weigh ~6 lbs each on average, then the 4 chickens put out 192 BTUs per hour, which is about the same as a 56 watt heater. If you have a chicken coop with a larger flock, say 25 birds, that is like having a 400-450 watt heater in your coop. When you debate whether or not to heat the coop, it is very important to consider the number of chickens you have. To Heat or Not to Heat? In the end, my decision is to heat, but sparingly. I heat ONLY on the very cold nights (-15°F or colder) with a 100 watt heat emitter. My goal is to keep the coop temperature about 10°F. On a cold night where it was -30°F here, my coop was 8°F. I don't turn on the heat emitter unless I think the outside temperature will be below about -12°F. This is based on tracking coop temperature v. outside temperature, see chart below. ~56 watts of chicken body heat. 60 watts, intermittent, dog-bowl water heater. 100 watts, heat emitter, only on very cold nights (-12°F or colder outside temperature). 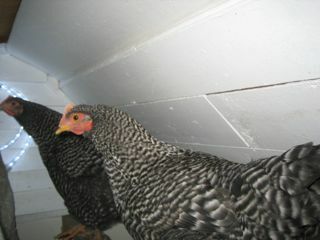 Coop Construction & Insulation: As a first-time chicken owner in 2008, I worked on the coop throughout the fall months. The coop was built about 90% with materials on-hand. I do not have photos from every stage of the construction. If you are interested in building a similar coop, I believe what you will find most useful here is how to make creative use of space, how to track and manage heat in a cold weather climate, and how to integrate a coop area into a corner of an existing structure (garage or barn). The coop is built into the southwest corner of the barn; the barn is framed with old-fashioned 2x4s (which actually measure 2x4, unlike modern 2x4s). I airsealed the cracks in the exterior walls with polyurethane 3x expanding foam, and then stuffed in fiberglass insulation (which had been removed from my house to make room for better insulation). I then covered over the insulation with a mish-mash of various building materials that I had lying around - including hard-board masonite and some reused clapboard siding from my neighbor's free pile. I put in a 2' x 4' dropping board under the 4' roost going the length of the coop. Walls 4" fiberglass, plus air sealing. R-value 3.14 per inch. Roof 3" extruded polystyrene (styrofoam) sheets. R-value 5 per inch. * Note - for human houses in our area, the recommended roof R-value is 49-60. So 15 is pretty marginal, and I could certainly increase insulation of the roof. My coop has two old single-pane windows, salvaged from my house. The windows face south-west, and on a sunny day, I get a fair amount of solar gain. One window has a chicken door where the 7"x9" pane was. I have covered one window with plastic over the winter. The second window is on my list of things to do some warmish day, to make a removable cover for it. Heating: Generally, I have been working on the idea to insulate the coop (one-time cost) instead of using a heat lamp all the time (on-going cost). Electricity here costs 13¢/ KWH. To run a 100 watt bulb all the time, is about $9.40 per month. To run a 250 watt bulb, is $23.40. Asking around, I was encouraged especially by Patandchickens (Ontario, Canada) and Mrs. AK-Bird-Brain (AK= Alaska) to not use a heater. Mrs. AK-Bird-Brain says her birds stay outside into the single digits; however, her birds have pea combs. If you have single-comb chickens, as I do, you do need to be more concerned about frostbite. Water Heating: I have the Farm Innovators 60 watt dog dish. Since I have only 4 birds, I use a small chick waterer with a quart-size plastic jar, which I simply put in the dog dish. I have two of these. I take fresh water out in the morning, and bring the other one inside to fill it for the next morning. The dog dish helps prevent spillage in the coop. The dog dish heater turns itself on and off. When it is very cold, I find that the water freezes up inside the bottle, even if the water in the tray is still liquid. Lighting: I've decided to light just a little to 12-13 hrs of daylight, using an LED rope light. This uses about 4 watts of power. My light is on a timer, and comes on at about 4 am. Ventilation & Humidity: The coop has a removable 34x20 window panel to allow for lots of ventilation in the warm weather. In the winter, the coop is ventilated via a 1" slot x 4' wide, and by a large triangular vent (1' wide x 8" high) - these are vented to the inside of the barn, so there is air movement, but not a lot of wind / drafts blowing through. I have a weather station wireless probe inside my coop. I have a second probe my front porch, to measure outside air temperature. Both are in shaded locations. These both register max-min temperatures. So, I can see how cold it is getting at night inside my coop and outside. Put vaseline on combs, just to try it. Vaseline on combs 2 days before this, not for this night. Day before was not very sunny, coop did not heat up much. Day before was not very sunny; very windy. Day before was not very sunny; the whole big barn is cooling off inside. Using the 250 watt heat lamp, not aimed at the probe. The water in the chick waterer inside the heated dog-bowl froze at the top of the container. -13°F 45°F Using the 250 watt heat lamp, pointed more toward the probe. This is ridiculous! No way is the coop going to be 45°F in Jamuary!! -13°F 10°F 10° colder than it was supposed to be, so I didn't even vaseline the combs. Temp at sunset was around 25°F in the coop. This was the coldest temp in the coop yet - everyone looks fine and happy. -20°F 6°F Brr, again the NWS was off on the forecast; it was 11° cooler than they said it would be. Coop temp held up well, but I would like to use the new 100 watt ceramic heat emitter on nights like this. 8°F At 10:30 pm, outside temp is -18°F, but it's 23 in the coop. The 100 watt emitter is looking like it is going to be PERFECT to keep the coop in the teens for those -25°F nights. In the end, this was the coldest night I have experienced in my 7 winters in Vermont. *My wimpy thermometer maxed out at -21.8°F, so I don't know how cold it really was. -18°F 19°F I turned on the 100w heat emitter around 11 pm when it was -10°F outside, and 19°F in the coop. From there, the coop temp went up, while the outside temp went down. The previous day had been clear & cold (falling temps; high around 11) but inside the coop it hit 38°F thanks to the south-facing windows! November - Our temperatures in mid-November have been around 13-14 F several nights running. On cold nights, I was covering up the larger window (the one that comes out in the summer for good ventilation) with a quilt. Still, I was getting low 20s F in the coop, according to my max-min thermometer, when the outside temps were in the low teens F (according to my other max min thermometer). In essence, the coop was tracking about 10-12 degrees F higher than the outside temps. OK for now, but not at -25 F.
Nov. 23 Improvements: Based on feedback from other cold weather denizens, I put plastic up over the smaller window (non-operable in winter), and decided to make a smaller area within the chicken coop around the roost. I moved the quilt from covering the window to make a coop-quilt area. I slightly improved the weather stripping on the large window. Last I checked my coop is 36F while outside it is 18F. That is a big improvement!! Nov. 24 improvements: I decided to buy a heated dog-water bowl, to put my chicken waterer inside the bowl. This is thermostatically controlled 60-watt heater. Since I was going away for Thanksgiving, this was critical since my chicken-sitters couldn't be asked to take out unfrozen water 2x a day. Loved the data and the way you brought us along with you on your journey.